METTLER TOLEDO today announced the publication of a new white paper in its Recent Advances in Organic Chemistry Series entitled “The Next Steps in Enzymatic Catalysis.” The paper reviews three examples of enzymatic catalysis in military, pharmaceutical and academic labs where ReactIRTM was used to monitor reaction progress. Robust, real-time in situ monitoring with ReactIR™ allowed researchers to achieve desired results while simultaneously reducing reaction costs and enhancing safety for cleaner, greener chemistry. Using mid-IR spectroscopy, ReactIR™ creates a “molecular video” of ongoing reactions via a robust probe inserted directly into the reaction vessel. The elimination of offline sampling provides more reliable data, and fewer interactions with volatile or toxic reaction components. Concentration changes of all key reactive and transient species can be monitored, allowing for easy mechanism/pathway determination and kinetic parameter definition—critical when reviewing the effectiveness of enzymes as catalysts. The paper’s authors highlight each context in which ReactIR™ helped answer these and other key reaction questions safely. In the first example, “Application of Chemoselective Pancreatin Powder-Catalyzed Deacetylation Reaction,” Lek Pharmaceutical researchers used ReactIR™ to study and optimize reaction conditions/catalyst load. Their experimentation proved that an enzymatic catalysis employed under mild conditions could be high-yielding and economically favorable. Example two, “Monitoring of Bayer-Villiger Biotransformations of Ketones to Lactones,” used ReactIR™ to monitor reaction progress and kinetics in proof-of-concept work. ReactIR™ proved a useful tool for the rapid quantification of sensitive enzyme-catalyzed Bayer-Villiger biotransformations using the simplest calibration mode. The complex culture medium in the whole-cell catalysis process did not interfere with results. 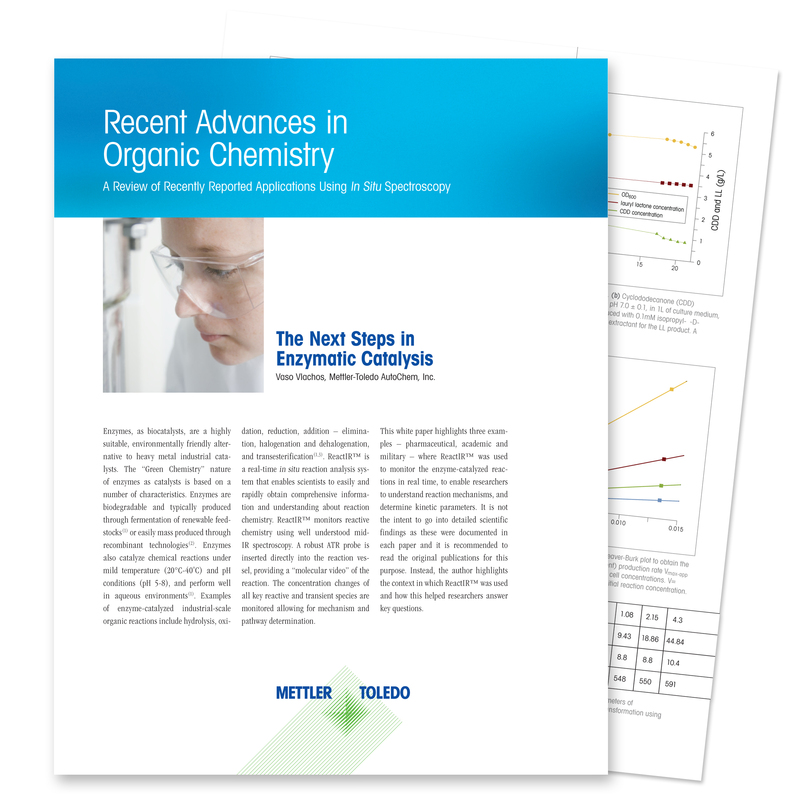 In the third and final review, “Enzymatic Hydrolysis of Organophosphates and Organophosphonates,” the inline approach of ReactIR™ allowed quantitative monitoring of reaction progress. Researchers were able to use small chemical quantities, avoid cross-contamination, and significantly reduce risk of toxic exposure—all measurable gains over other previously-tried methods such as titrimetric pH-stat. In all examples, ReactIR™ proved non-invasive and non-destructive to chemical reaction components. This allowed researchers to more easily describe each biotransformation and ultimately improve yield.